The University of Maine at Presque Isle is pleased to announce that John Paul Caponigro, a world renowned master of digital printing and photography, will serve as the next speaker in its 2014-2015 Distinguished Lecturer Series. Presented by Canon USA’s Explorer of Light program, Caponigro will deliver his talk Antarctica on Tuesday, Oct. 21 at 7 p.m. in the Campus Center. His talk is free and the public is invited to be a part of this special evening. During his visit, Caponigro will serve a unique dual role as UMPI’s DLS speaker and the artist exhibited at the Reed Fine Art Gallery. His exhibit, also entitled Antarctica, will be on display in the gallery from Oct. 20 through Nov. 29. There will be a special reception, book signing, and gallery talk by the artist in the Reed Gallery on Oct. 21 from 5:30-6:45 p.m.—just prior to his DLS presentation. Light refreshments will be served and the public is invited to attend. During his talk, Caponigro will discuss his voyages to Antarctica—he’s been on five such trips, most recently in Feb. 2013—and the very unique opportunities he’s had to sail past the Arctic Circle and see and photograph sights and passages that few people have ever seen. 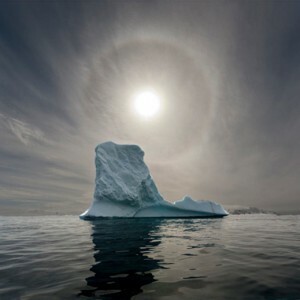 Caponigro has conducted three photographic workshops in Antarctica (2005, 2007, 2009). He uses his photography there to raise awareness about the region, climate change, and the work of the real experts—scientists. Caponigro is one of the most creative visual artists working today. Dedicated to fostering the growth of creativity in others, he exhibits, writes, lectures, and teaches seminars and digital photography workshops. Inspiring conscientious creative interaction, his life’s work is a call to connection with our natural world, with each other, and with ourselves. He is respected internationally as one of the most prominent artists working with digital media processes. Exhibited internationally, his work has been purchased for numerous private and public collections including Princeton University, the Estée Lauder collection, and the Smithsonian. His work has been published widely. Reviews have appeared in numerous periodicals and books including Art News and The Ansel Adams Guide. Author of Adobe Photoshop Master Class (Adobe Press), and the DVD series R/Evolution, he is a contributing editor for Digital Photo Pro and Camera Arts and a columnist for Photoshop User, After Capture, and apple.com. Caponigro is a member of the Photoshop Hall of Fame, one of Canon’s Explorers of Light, and an Epson Stylus Pro. His clients include Adobe, Apple, Canon, Colorbyte, Epson, X-Rite, Kodak, and Sony. You can learn more about the artist by visitingwww.johnpaulcaponigro.com. The University’s Distinguished Lecture Series was established in 1999. Each year, the UDLS Committee sponsors four to six speakers who come from Maine and beyond, representing a range of disciplines and viewpoints. While the emphasis tends to be on featuring visiting academics, it is not exclusively so. The speakers typically spend two days at the University meeting with classes and presenting a community lecture. All are invited to attend the Oct. 21 reception, book signing, and Caponigro’s distinguished lecture. For more information about this event, contact the University’s Community and Media Relations Office at 207-768-9452.